About 20 miles (32 kilometers) away, Dallas Jane Combs, 79, died after a suspected tornado destroyed her Adairville home earlier Saturday, the Logan County Sheriff’s Office told media outlets. Sheriff officials said Combs was inside the home when it collapsed on her. Combs was pronounced dead at the scene. 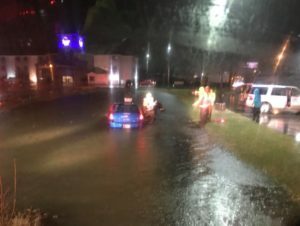 Left: Henderson Fire Department in Tennessee rescues a person from a flooded car. Photo courtesy of Henderson Fire Department.